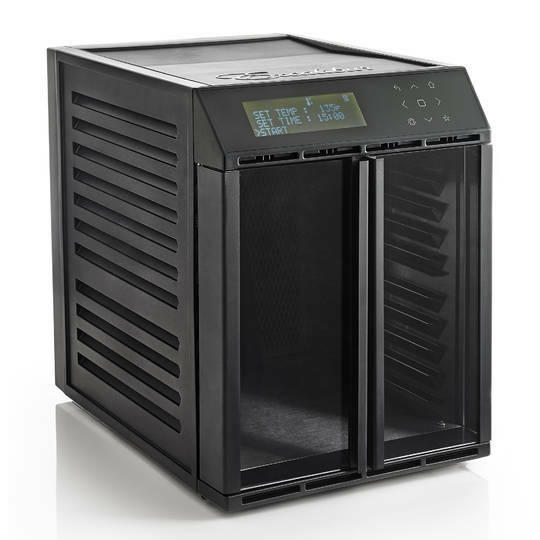 The RES10 is Excalibur's most flexible dehydrator. That's because it has two individual drying chambers, each with their own fan and thermostat. It's like having two dehydrators in one. 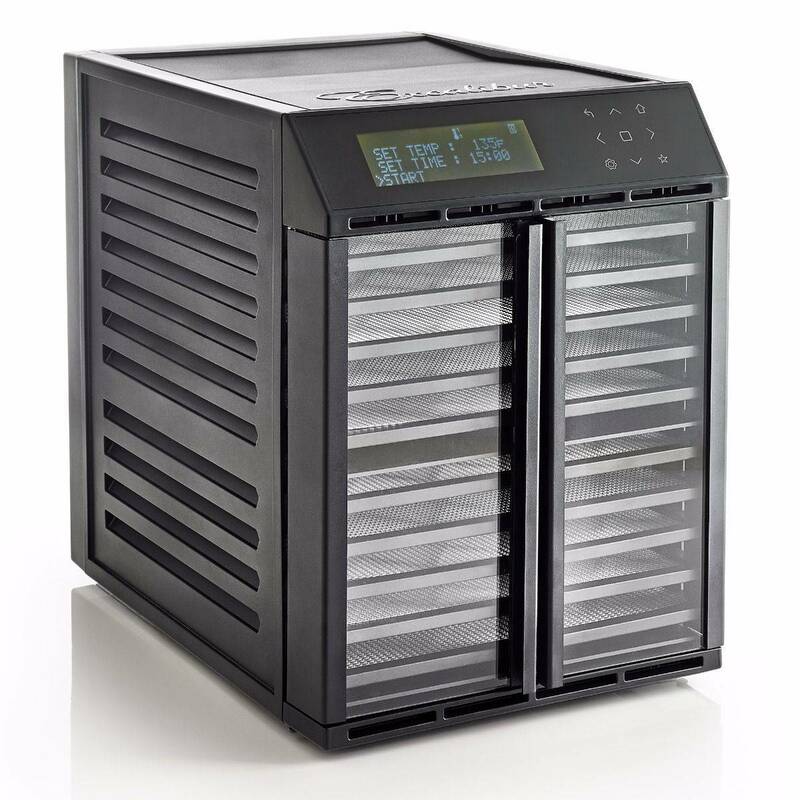 A removable horizontal inner divider lets you create an upper and lower drying chamber, each with their own fan and thermostat. This gives you the ultimate flexibility with ingredients. You could dry apples in the lower chamber with their own time and temperature settings, while you dry beef jerky at a higher temperature in the upper chamber. 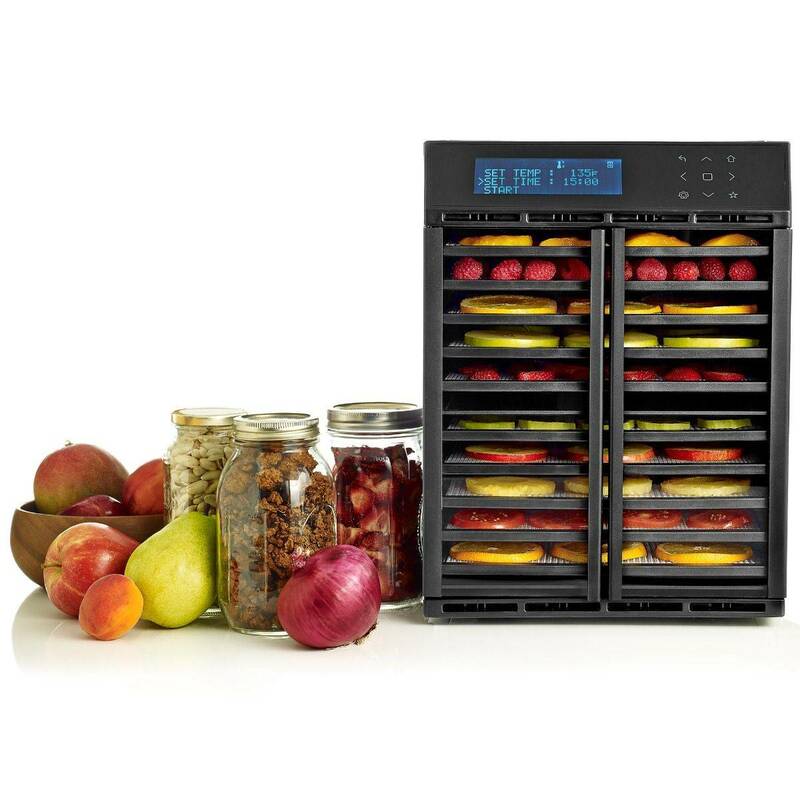 Digital controls with an easy-to-read blue display makes programming fast and simple. 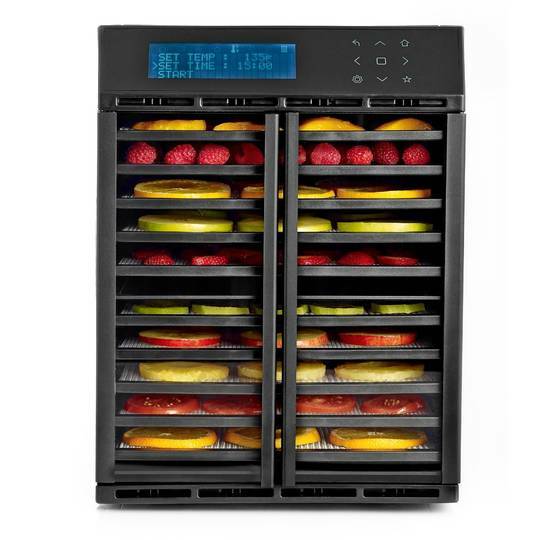 Each zone can be set for 1 or 2 time durations and 1 or 2 temperature settings for variable food drying needs and to speed up the drying process. You can also program and save 30 of your favorite recipes. The Excalibur RES10 offers an adjustable digital thermostat from 29.4°C to 74°C. This gives it the flexibility to do low temperature or raw cooking, preserving the active enzymes and nutrients in ingredients. 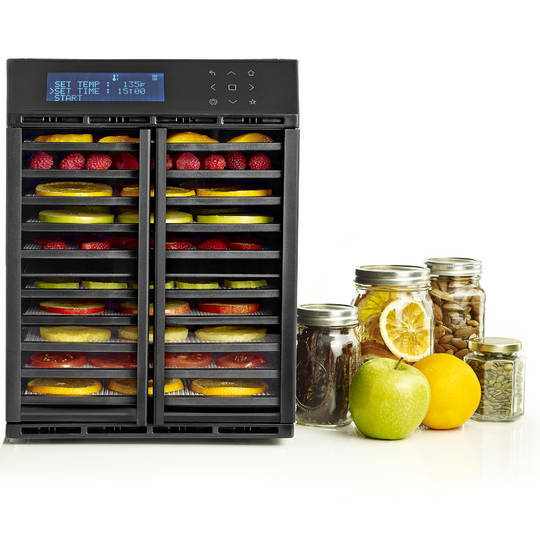 It also is high enough for safe dehydrating of meat for jerkey or pet treats.The two-time, two-temperature system means you can set an initial short higher-temperature drying period followed by a long low-temperature drying period, according to your recipe. And the 99 hour timer means you can set the times and temperatures and let the RES10 do the rest. You can leave it knowing that it will shut off or change temperatures automatically. Unlike cheap dehydrators using stackable trays with a hole in the middle, the RES10 uses Excalibur's Parallexx® Horizontal AirFlow system. 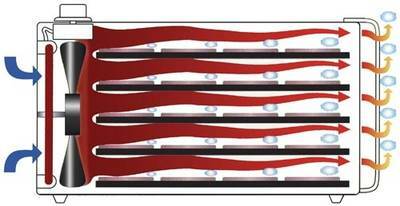 This means that heat flows from the back horizontally across the trays, ensuring uniform drying results. 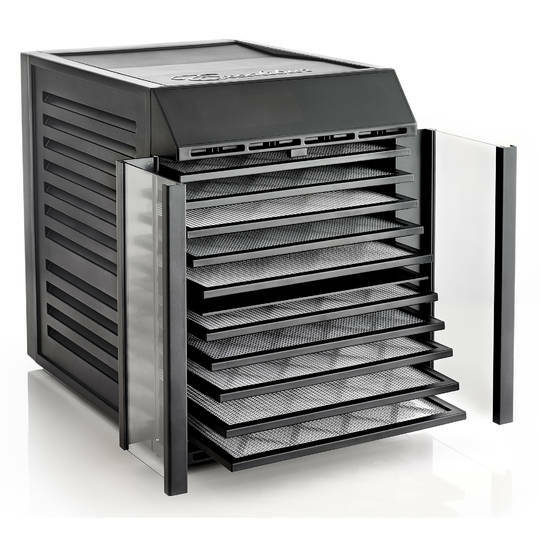 The stainless steel trays pull out horizontally, like in an oven. You can access any individual tray without unstacking. The motor is protected from any spills, and cleanup is simple. Just remove the bottom tray for easy and fast cleaning. Make natural snacks from pureed fruit or yogurt. Just pour, dehydrate, and peel. Non-stick sheets for Excalibur dehydrators. BPA-free. 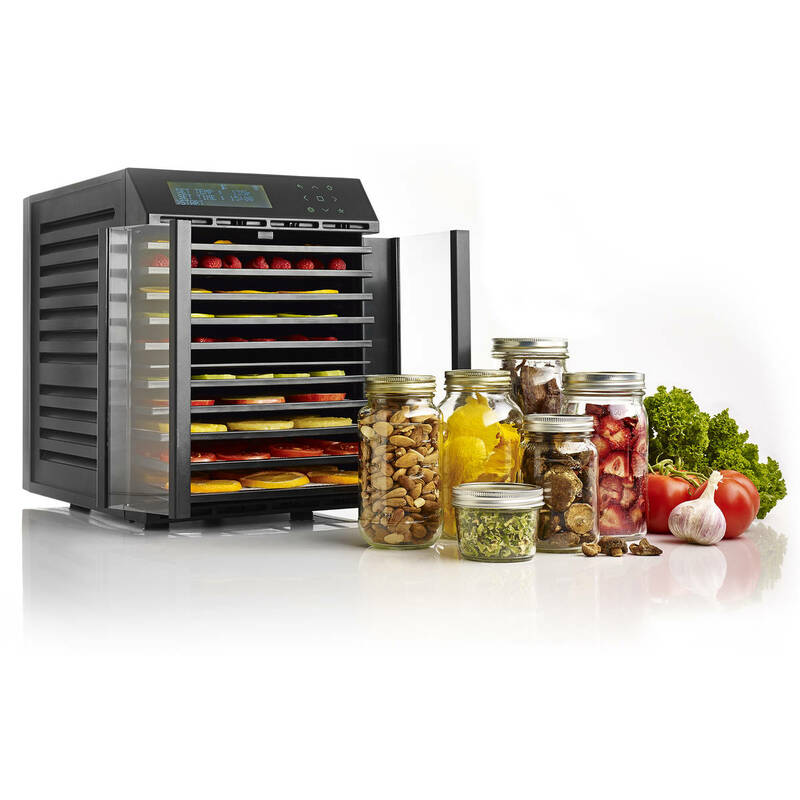 I was looking forward to having this brand new dehydrator at home and I´m really satisfied with it. 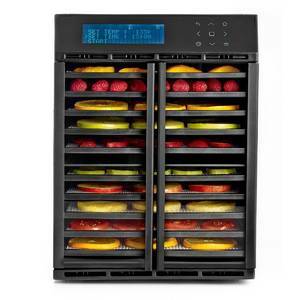 It´s easy to operate and all dry products are absolutely delicious! I am interested in the exc10el. 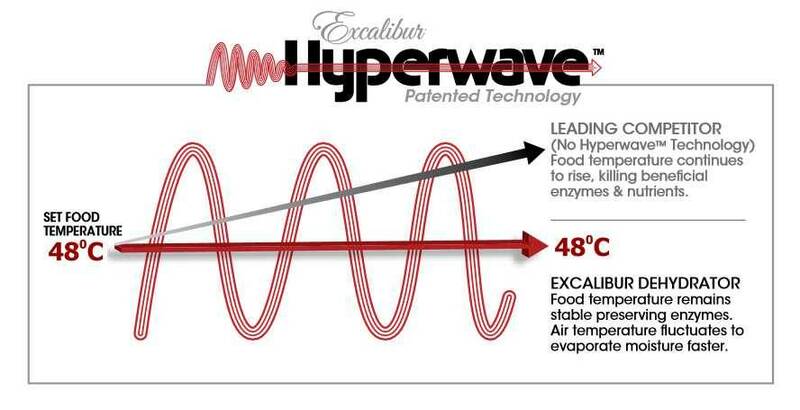 It seems that this is the product I am looking for but you specifications do not match the specifications on the excalibur website. So I am afraid if I buy this product it will not be the product I am expecting. Could you check the specifications and let me know if they are correct? The human body is designed to be healthy and productive beyond the age of 100. Eating a diet of raw and living food automatically improves health, slows aging, adds to mental clarity, strengthens bones, and boosts immune power. This is our New Edition of Preserve It Naturally, complete with a new Chapter on Raw and Living Foods and more Recipes. Superfoods are a remarkable dietary addition to ensure that the full nutrient spectrum is available in optimal amounts. 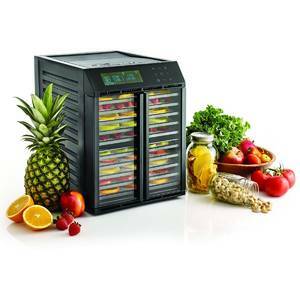 An excellent guide to everything you need to know about Dehydrating Raw Foods. The best way to keep food fresh. Includes vacuum pump.